1950s. New versions of Green Lantern and The Flash had achieved commercial success, and The Justice League of America, a group containing those characters and several other DC headliners, was well on its way to doing the same. Marvel Comics publisher Martin Goodman suggested to editor Stan Lee that their company do a superhero group of their own. In the fall of that year, Fantastic Four #1 hit the stands, with a script by Lee and art by the already legendary Jack Kirby. Since Marvel didn't have any ongoing superheroes, Lee simply invented a few — handsome young scientist Reed Richards; his best friend, Ben Grimm; his girlfriend, Susan Storm; and Sue's then-teenage brother, Johnny. Without waiting for official clearance, they flew an untested and inadequately-shielded space ship through a patch of cosmic rays. In keeping with comics tradition, instead of developing cancer or being killed outright, they acquired super powers. Reed became stretchable, like the old Plastic Man, and adopted the name "Mr. Fantastic". Ben's body was grotesquely transformed, but he became super-strong. He called himself "The Thing". Sue got the ability to turn invisible, along with other powers that remained dormant at first, and took the name "Invisible Girl". (A later, consciousness-raised generation of Marvel creators re-dubbed her "Invisible Woman".) Johnny became able to generate flame from his body and use it to propel himself through the air, just like the old Human Torch — and since Marvel owned that character, "The Human Torch" was the name he took. Occasionally, one of the four might leave the group and be replaced by another super-powered person, such as Power Man or She-Hulk. But the departing member always comes back. Those four characters have been The Fantastic Four since the day of that rocket ride. From the beginning, The Fantastic Four were handled differently than other superheroes. They didn't hide their identities. They bickered among themselves. At first, they even wore street clothes while performing super-deeds. Readers responded favorably to these innovations. With the fourth issue, the blurb "The World's Greatest Comic Magazine" was added to the masthead, and many thought it no exaggeration. Fantastic Four became the flagship title of an industry juggernaut, and has been in continuous publication from then until now. The fourth issue (May, 1962) contained the first of what was to become a hallmark of 1960s Marvel — the crossover. After stalking out in a huff, Johnny went wandering in the less savory parts of New York City. There, he found an amnesiac Sub-Mariner, whose last appearance in comics had been in 1954, living in a flophouse. His memory restored, Subbie became a recurring foe — and for a while at least, Reed's rival for Sue's affection. The team's arch-enemy, Dr. Doom, was introduced in the fifth issue (July, 1962). Two years later, Doom's background was revealed, and from there, he went on to become one of comics' most famous villains. Many believe the main Star Wars villain, Darth Vader, owes much of his appearance and character to Dr. Doom. Other significant Lee & Kirby characters introduced in Fantastic Four include Galactus (who eats planets), The Silver Surfer (Galactus's herald/assistant), The Inhumans (an entire race of super beings), The Watcher (an immensely powerful being who never uses his power, but only observes), Warlock (who later had a strong fan following), The Black Panther (perhaps the first successful black superhero in comics) and The Impossible Man (who is more-or-less impossible). Fantastic Four Annual #3 (1965) featured the marriage of Reed and Sue, which missed being the very first superhero wedding by only a few months (DC's Aquaman had tied the knot less ostentatiously at the end of 1964). The wedding story guest-starred every single superhero in the Marvel stable — and by then, there were lots — as well as such non-super characters as Patsy Walker and Millie the Model. Three years later, their son, Franklin Richards, was born. He grew to become comicdom's first second-generation superhero. In 1967 and again in '78, The Fantastic Four was made into a TV cartoon. The former, which was produced by Hanna-Barbera and appeared on ABC, had such limited animation, it was virtually nothing but a series of televised comic books. In the latter, only three members were present. Given the way 1970s pressure groups campaigned against dangerous behavior in kids' cartoons that can supposedly be imitated by real kids, it's not surprising that The Human Torch was replaced by a cute little robot named Herbie (no relation). But no, the reason for leaving the Torch out was, rights to the character were optioned elsewhere. To tie in with the show, the comic book version of Reed made a "Herbie the Robot" of his own, just like the one on TV — but didn't kick the Torch out to make room. This animated version was produced by DePatie-Freleng, best known for The Pink Panther, but which also had superhero experience of sorts with Super President. The studio was later bought by Marvel. 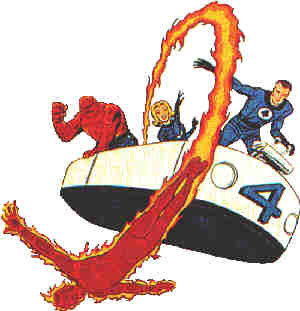 The Fantastic Four property has been optioned for movies several times, and occasionally even produced. But it wasn't until several years into the 21st century that it finally achieved success in that medium. 20th Century Fox released Fantastic Four in the U.S. on July 8, 2005, with Ioan Gruffud as Mr. Fantastic, Jessica Alba as Invisible Woman, Michael Chiklis as The Thing and Chris Evans as The Human Torch. But in comic books, the self-styled "World's Greatest Comic Magazine", under a long succession of post-Lee/Kirby creators, continues to entertain generation after generation of comics readers. Text ©2000-07 Donald D. Markstein. Art © Marvel Comics.